You may take the test at any approved driver training school in the state. If you take your test at a driver licensing office that offers testing, it will be taken on a computer unless you need special accommodation. It is a multiple-choice test with 25 questions, and you must correctly answer 20 of them to pass the test. Use your high beams if it is also raining. By law, your vehicle’s headlights must be turned on from a half hour after sunset until a half hour before sunrise. You should use your high beams whenever there are no oncoming vehicles. Stop their vehicle at or near the scene. Not stand or walk in traffic lanes. Turn off the ignitions of wrecked vehicles. If you are involved in an accident, you must stop at or near the scene. Move your vehicle out of the way of traffic, if possible. Do not stand or walk in traffic lanes as you could be struck by another vehicle. Turn off the ignitions of wrecked vehicles. Trucks are permitted on an upcoming narrow bridge. The bridge ahead is open to one-way traffic only. The bridge ahead is wide enough for only one car at a time. The bridge ahead may be too narrow to meet or pass a truck. Warning signs are used to warn drivers about upcoming hazardous conditions and are usually yellow with black markings. 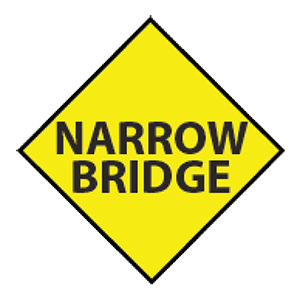 This sign warns drivers that an upcoming bridge may be too narrow to meet or pass a truck and that they should be careful. Should merge into a lane in the direction of the arrow. Should come to a complete stop. May turn left after yielding to oncoming traffic and pedestrians. Have the right-of-way and may expect oncoming traffic to stop for them. A flashing yellow arrow indicates that left turns are allowed in the direction of the arrow. However, the oncoming traffic has a green light and you must yield to oncoming traffic and pedestrians. Enter at any time, whether or not there are other vehicles or pedestrians present. Stop in the intersection to yield to traffic entering on the right. Always drive around the circle to the right. You can drive to the left. Inside a roundabout, you must always drive around the circle to the right. When entering a roundabout, you must yield to traffic that is already in the circle, as well as to pedestrians and bicyclists who are crossing the road. Signal, yield to existing traffic, and enter at the same speed that traffic is moving. Signal and enter the freeway. Freeway traffic must yield. Drive slowly so you can check traffic. Always come to a complete stop first. When merging into traffic, you should signal and enter at the same speed that traffic is moving. Always yield to other traffic when entering a roadway.